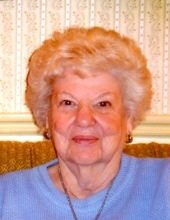 Lorena Carson McCausland, at the age of 98, passed away peacefully in the quiet, early hours of January 17, 2019 in Kent, Washington. She was born November 5, 1920 in Fairfield, Utah to Ether Harvey Carson and Lillie Leona Benson Carson. She was the 5th of 7 children. She attended schools in Fairfield and Lehi, Utah. At the age of 17 and a senior in High School, her father was killed in a gravel pit accident. Soon afterwards they moved to Provo. It was here that she met Charles Robert (Bob) McCausland and they were married on November 29, 1941, in Provo, Utah. After WWII and Bob’s return from the war, they built a home in Pleasant Grove and lived there for 45 years and raised their family. After her children were raised, she secured a job at Z.C.M.I. department store in Orem, Utah, in the “Better Dresses Department”. She loved seeing the new clothes, selling and associating with the customers. And she loved the friendships that she made while working there. In 1990, they moved to Spanaway, Washington to be closer to their children and grandchildren. She was an active member of The Church of Jesus Christ of Latter-day Saints and served and attended faithfully. She had a “Zest for Life” and always had a positive, fun-loving and forgiving nature. She was a wonderful homemaker, a good cook and provided a wonderful, welcoming home for her family and all who visited. She is survived by her son, Charles Brent (Colleen) McCausland, daughter, Deanne (Bruce) Sabey, 5 grandchildren, Sonya and Jarod McCausland, Jesse and Beau Sabey, Lorie (Sabey) Clegg and 6 great-grandchildren. She was preceded in death by her husband, Charles Robert (Bob) McCausland, a daughter, Ann and a grandson, Jason McCausland. To send flowers or a remembrance gift to the family of Lorena McCausland, please visit our Tribute Store. "Email Address" would like to share the life celebration of Lorena McCausland. Click on the "link" to go to share a favorite memory or leave a condolence message for the family.